This project involved the design of two new high volume, signal controlled intersections, one at William Penn Highway and Emrick Boulevard, and one at Freemansburg Avenue and Emrick Boulevard. The two intersections serve as the entrances to LVIP VI, with Emrick Boulevard being the park’s main corridor connecting William Penn Highway and Freemansburg Avenue. 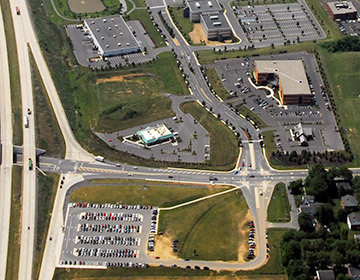 Hanover Engineering was retained by LVIP, Inc. to design the two intersections and roadway improvements, and to prepare the required highway occupancy permit plans and traffic signal permit plans for these intersections, as well as the intersection and access road for the proposed Park and Ride facility on William Penn Highway. The proposed intersections were located in areas being planned for improvements in conjunction with PennDOT’s PA Route 33 project. The design of the intersections and associated roadway improvements had to incorporate PennDOT’s proposed widening and relocation of William Penn Highway and Freemansburg Avenue. Due to the overlapping improvement work being proposed on William Penn Highway and Freemansburg Avenue for the LVIP VI and Route 33 projects, a legal agreement was negotiated between LVIP, Inc. and PennDOT for construction of the required intersections and associated roadway improvements. Hanover Engineering was able to work successfully with PennDOT personnel and their contractor to ensure the cost effective and timely construction of these two critical access points to LVIP VI.